← Al Dronsfield reports on the ND (Northern District) Masters!! John Brown’s Newspaper Article of 2018 03 27. Golf Lakes hosted the Masters last Wednesday, March 21 to Saturday March 24. The 44 players competed vigorously, with great sportsmanship and friendship, a fine capstone for the 2017-2018 season. Marilyn Rotman, a retired greenhouse owner and President of the Michigan Shuffleboard Association who has shuffled for about five years total, playing out of Paradise Bay placed first in the District Amateur Division. Second place went to Mary Fowler on her home courts who found the Masters a real pleasure, laughing about making new friends on such a cold and windy day on Wednesday, her first and last opportunity to play in this division as she will be a State Amateur October 1. Third place was won by Elaine Antaya, who plays every Wednesday at Blackstock, Ontario all summer. Elaine’s first teacher as a student of shuffleboard was Patty Yates, of Palmetto Shuffle Club. Elaine played often in District Tournaments here with her husband, Patrick. Rita Marderosian, retired from the Massachusetts Department of Corrections, placed fourth. Mother of one and grandmother of three, she has six years of experience and resides at Golf Lakes. Placing fifth, Ursula Joyal traveled daily from Sun City Center and had a blast playing the Masters. She and Maurice drove far to make new friends and gain valuable experience. Martha Kaufman spent 25 years in Sarasota before moving to Golf Lakes a year ago, where she discovered shuffleboard. She finds it easier to make friends and less hard work than traveling for years with her daughter showing quarter horses. Placing sixth in the Masters and playing Tuesday nights at Golf Lakes is a nice beginning to a whole new career. Cheri Wargo placed seventh. A retired Administrative Assistant in the securities industry, Cheri also likes gardening, crafts, watching Rick Hall drive racecars, and plays Scrabble. First Place in the Mens Division of the SWCD District Amateurs was secured by Patrick Antaya of Lindsay, Ontario. The Antayas have played together, learned together and traveled together. They express appreciation for the tournament directors and all those who make such a tournament possible. Second place went to Tony Sousa, a big, strong, jovial fellow who makes most of his chosen shots. Tony says he really loves this game. Third place was won by Cau Huynh, a small player who is also very accurate. Winning many points this season, Cau also plays in several other sports, such as golf, table tennis, pickle ball, well you get the idea. Born to Vietnamese parents, Cau has been in America a few decades and has a great time. Fourth place, Dale Overzet grew up on a Michigan farm, served in the Navy, worked as a data processor, then sold stretch Shrink Wrap while owning and operating an Ice Cream and fast food store with mini golf for 19 years. Dale really enjoys the fellowship of the shuffleboard fraternity. Fifth place went to John Hoeksema of Golf Lakes who plays quietly and effectively. Sixth place went to Donald Trottier of Bradenton Tropical Palms, a quiet, intensive player. Seventh place went to Mike Collins of Bradenton Tropical Palms, a fairly new, jolly, outgoing player. In eighth place was Maurice Joyal who plays at Sun City Center and who looks forward to next season to gain more tournament experience. In this, the second year of a Masters for State Amateur players, Kathy Laver placed first. Playing out of Hawaiian Isles, Kathy is 2nd V.P of the Southwest Coast District. Kay Lynn Duncan of Haslett, MI and Tropic Isles Shuffle Club V.P, placed second in the Ladies Division. Kay Lynn is Secretary of the SWCD, and moves up to Pro October 1. She also won 1st Place of 33 entries in the Traverse City Cherry Festival Invitational Shuffleboard Tournament in 2017. Third place went to Sandra Kolasinski of Village on the Greens. Full time in Florida now, Sandi still visits Massachusetts and Vermont each Summer. Sandy is parent of 2, grandmother of 5, and great-grandmother to 4. Shuffling for 14 years now, she loves it and looks forward to October to start again. Dian Darrah, fourth, spends Summer in New Hampshire working at a Music Institute. She winters at Paradise Bay and shuffles to improve her game. Dian is an Assistant District Tournament Director. Janice O’Sullivan of Sea Breeze placed 5th. She plays a credible game and played in several tournaments this season. Rick Hall placed first in the Mens State Amateurs. Coming from Western PA, Rick has raced cars on dirt tracks for 41 years. He owns Halls Safety Equipment which services utility companies. This is only his 4th year of shuffling. David Evenson of Palmetto placed second. Dave is a Past President of Palmetto and works on the discs and courts also. Larry Fowler of Golf Lakes placed third in his second State Amateur Masters, feeling honored and appreciative of many new friends. We have observed that Larry does a lot of work at Golf Lakes Shuffleboard. 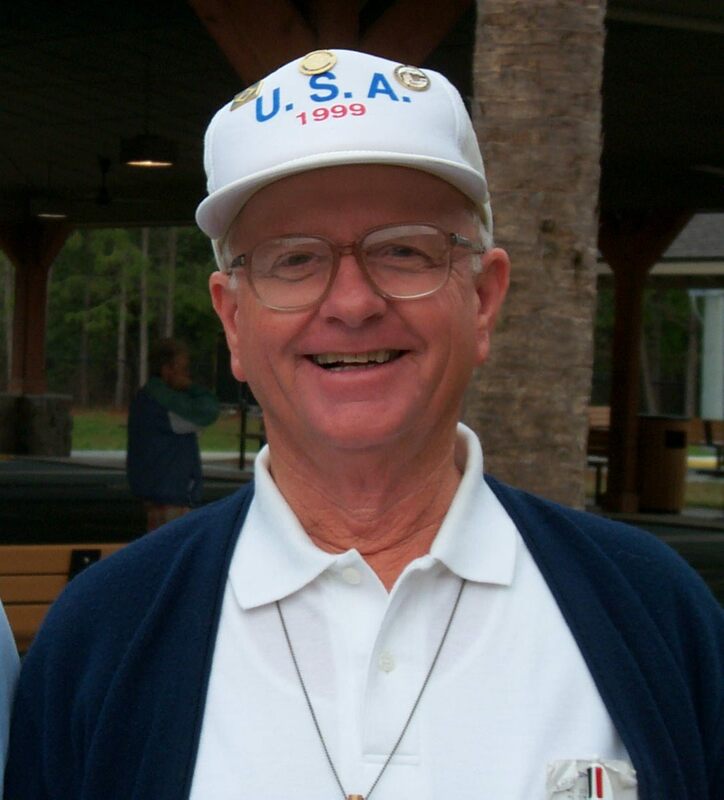 Frank Marderosian, Past President at Golf Lakes Shuffleboard placed fourth. Frank, like Rita, is retired from Massachusetts Department of Corrections. Jim Lessard placed fifth in his first State Amateur Masters. Retiring after 35 years at AT&T, he and Mrs. Lessard traveled in a motor home for many years before settling into Ellenton Gardens. Bill Bierema, age 90, of Golf Lakes placed sixth, obviously enjoying every minute of it! Many of us hope we can still play at that age. Don Sprague of Lincoln Arms, playing out of Bradenton Shuffle Club, placed 7th. Don has earned his 5 move-up points within 3 years and will be a Pro in October. Due to space limitations we will only list the places of the Pros, with more to say about each next week. Ladies: 1. Lois Wegner, 2. Cheryl Putnam, 3. Evelyn White, 4. Arlene McCague, 5. Pat Tomko, 6. Linda Wallingford, 7. Shirley McCullough, 8. Marlene Coburn/Judy Cross. Men Pros: 1. Faren VanDeGrift, 2. Jim Miller, 3. Bob Kendall, 4. Ron Nurnberger, 5. Ralph Lozano, 6. Grant Childerhose, 7. Dwayne Cross, 8. Larry Taylor, Alternate John Mickle. FL P-25 at Lakeland, March 19. Ladies Main: 1. Pam Nurnberger-Terri Smith. Today is the second day of FL P-26 Tournament of Champions Pros Only, Must Qualify. Next Monday, April 2 at Hawthorne Florida Masters, M/L, W, N-W.